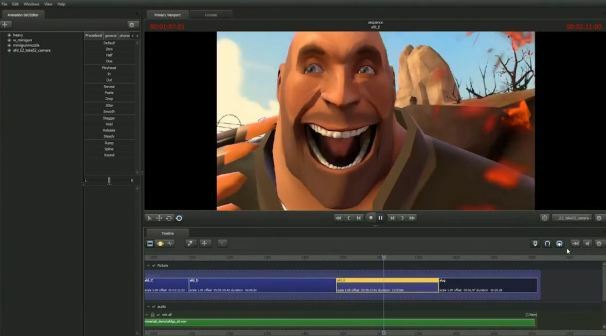 When Valve released the last of their Team Fortress 2 “Meet the…” videos last month with Meet the Pyro, they also made waves by announcing that they’d release the tools used to make the company's machinima videos for Team Fortress 2, Portal and the various other Source engine games as a software package called the Source Filmmaker. After a short closed beta the company released the package on Wednesday for anyone to download; after a few hours with the tools, we've got some thoughts. Unlike the Perpetual Testing Initiative that Valve launched for Portal 2 earlier this year, the Source Filmmaker is decidedly NOT a product that you can pick up and play with immediately. Users with a significant history in video editing or 3D animation will probably find a lot to enjoy, but the need to import a level, a camera, models and animations for your films will probably confuse Valve fans just looking to make some quick films with their favorite Team Fortress characters. For users looking to really dig into the world of machinima however, the Source Filmmaker could be a boon. The product was developedin conjunction with the filmmaking team at Valve, and it shows. The Filmmaker software is very clearly made by expert animators and storytellers looking to smooth out what they dislike in the traditional animation process. This can be counter-intuitive for the average user but it can also make the movie making process significantly easier once you reorient yourself. For instance, the easiest way to get characters and animations into your Filmmaker projects is to play and record an actual round or two of Team Fortress 2. While this has some disadvantages (you’ll probably need to grab some other players to “act” as other characters on screen or record yourself as each character individually), it also gives you a tremendous amount of “raw footage” that can then be edited and tweaked to your heart’s delight. Rather than forcing movie makers to create each element individually, Source Filmmaker wants you to get as much footage as possible “naturally” by recording the game and then allows you to tweak whatever elements you see fit using powerful in-engine tools. After spending some time with Source Filmmaker I’m of two minds about the software. On the one hand, there is an undeniable appeal to Valve’s approach to movie making; it really streamlines the process of animating while allowing you to control the individual elements on screen more precisely than any other machinima tool I know of. However, because the tool was so clearly made by and for experts I fear that the barrier to entry for creating films is too high to really involve the average Valve fan. I hope I’m wrong (and the Source Filmmaker team certainly seems dedicated to bringing more users into the fold, providing tutorials and promising new tips on the Source Filmmaker homepage) but it’s hard to imagine this tool will encourage many users who aren’t already interested in machinima to dive in and try to make movies.